is a smaller version of our show rosette which is ideal for cage bird and small animal shows and is manufactured to order ensuring that your individual requirements can be satisfied. 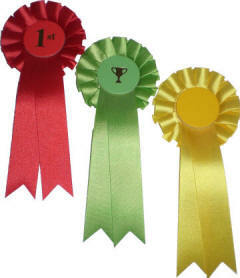 Our Mini rosettes consist of 1 Tier of 24mm Ruffle Pleated ribbon surrounding a 35mm coloured centreboard. The Mini rosette can be supplied with a plain centre or printed with either a placing or motif only. They are available in any ribbon/centreboard combination and can be supplied with either a safety pin or tape fastening. For printed Mini rosettes, a centreboard set up fee will be applied to each order. This is £5.00 for orders under £50 and £2.50 for orders above.